After seeing the very compelling cover art that adorns Void, it seemed worth a shot. But the pentagram placement in the logo seemed a bit “Thy Art is Murder,” which sounded the internal alarm at the same time. Turns out, there are some striking similarities between Within Destruction and the Australian deathcore act. 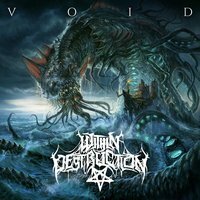 Within Destruction unfortunately relies upon deathcore chugs and groove for a large portion of the album. The lumbering, mid-tempo speeds maintain most of the album’s dynamic, with some occasional movements into blasting territory, and of course, some breakdowns (though they aren’t overbearing). Vocally, there’s nothing to separate this one apart from dozens of other like-minded acts, with the range of high-in-the-mix roars and pig squeals being the dominating factors. There’s nothing particularly wrong with what Within Destruction is doing, it’s just generic and it’s a bummer in comparison to the other piece of Void’s sound – dark and atmospheric melodies. Atop of the deathcore chugs, there are some rather interesting melodies in the tracks, particularly in “A Spiral Rift Towards Damnation” and “Martyrs (Of the Wendigo).” They add an additional layer to the band’s work, and are easily the strongest piece the band has going for them. The potential for Within Destruction is significantly high, but the dynamics need to shift away from the reliance on chugging riffs. Moving more emphasis to the rather well done melodies and cranking into more speed-driven waters (or move into doomier directions) could make for a deadly combination in the band’s future. Unfortunately, on Void, they just aren’t enough to hold interest for more than a few listens.